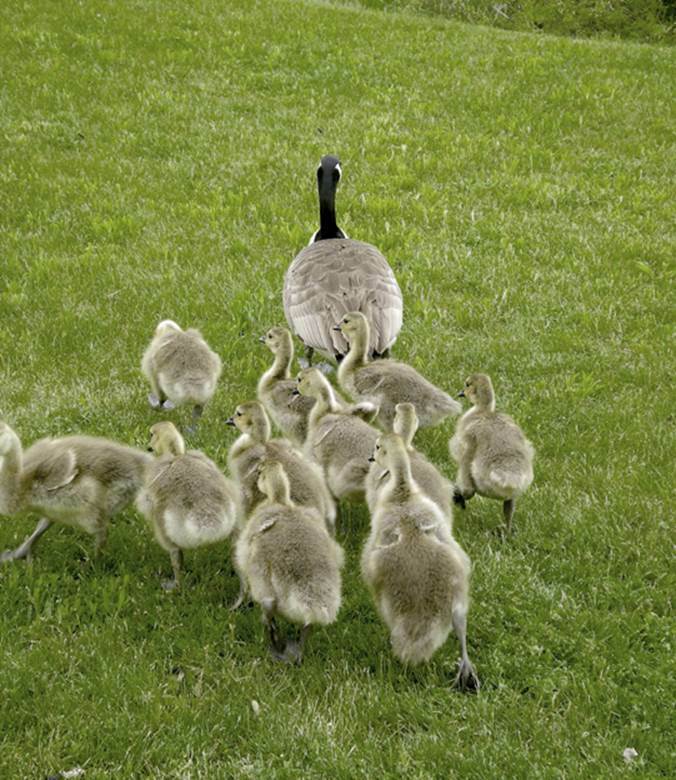 Within hours after hatching, baby geese or ducks start walking about, and follow their mother. But how do they know they are following their mother? In reality, they don’t, and studies have shown that they follow the first suitable subject they see within a critical period, measured in hours, and remain attached to this individual for a lifetime. This process is called imprinting and was first observed in about 1873 by Douglas Spaulding, an amateur English biologist, and then rediscovered by the German biologist Oskar Heinroth. It was Heinroth’s student, Konrad Lorenz, who was the first to study imprinting in detail, and he was the co-recipient of the 1973 Nobel Prize for his work on this topic. Lorenz, an Austrian zoologist, was one of the founders of modern ethology, the study of animal behavior. In studies conducted in about 1935, he found that after spending their first hours with him, young greylag geese followed him rather than their biological mother and strongly preferred him to a member of their own species. For bird species such as geese, which are feathered and active when hatched, the first thirteen to sixteen hours are critical periods for imprinting to occur. In mallard ducklings and domestic chicks, the imprinting opportunity is lost after thirty hours. By contrast, for birds that are born naked and helpless, the critical period is extended. Imprinting is an instinctive behavioral act, which, unlike learned associative behaviors such as classical conditioning or operant (instrumental) conditioning, occurs without the need for reinforcement or reward. In nature, the apparent biological function of imprinting is to recognize close relatives and establish an intimate, mutually beneficial social bond between offspring and parent. From the parent’s perspective, time, effort, and resources will not be expended for the care of another’s offspring. An offspring must recognize its parent or risk being attacked and killed by species members who are not biologically related. Imprinting also extends to sexual preferences, so that a young animal learns the characteristics of a suitable mate and only mates with those individuals that are not too closely related (sibling) or too far removed (another species). SEE ALSO: Associative Learning (1897), Parental Investment and Sexual Selection (1972). A number of studies with young birds have shown that the imprinting response is innate and that the young have no inborn recognition of who is their authentic mother.